After several warm and humid days in Melbourne, the black storm clouds rolled in yesterday evening. On the edge of the storm front, we consider ourselves lucky to have escaped unscathed for the storm's fury. However, I blame the unsettled weather for my next project. As the rain came down, a sewing frenzy was unleashed. It started with cutting strips of fabric without a ruler. Wonkiness was the aim! All a little on the wild side for my conservative self. But I allowed myself to work uninhibited and without plan, using techniques that I've not previously tried. There was a small light bulb moment when I realized that piecing a wonky patch was easy when working with wonky strips of fabric! There is no other outcome. It worked, I can sew wonky! As you can see I have used a combination of orange/white striped fabric and black/white striped fabrics, alternated with a white solid fabric. A splash of red has been added at random for interest, as well as a patch of solid orange fabric where the strips of fabric were cut too short. I also had fun quilting this mini quilt. Lines were stitched either vertically or horizontally in various section of the mini quilt. I also tried my hand at some curved quilting lines (with walking foot). 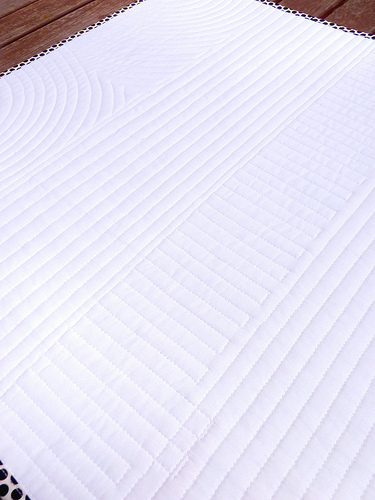 Curved quilting lines require steady stitching together with a steady movement which was not difficult to achieve on a small quilt. It's been a while since I've sat and sewn with such intensity and stayed up way too late. Today, I have added the binding, and have come down from my sewing high. No storms are forecast for tonight. Rita, it looks fantastic. No wonder you are thrilled and no wonder that you stayed up late! Love this one, Rita! What a great way to step outside your comfort zone. I have to try this business of letting go when the weather gets scary. I like the looks of unpredictable! 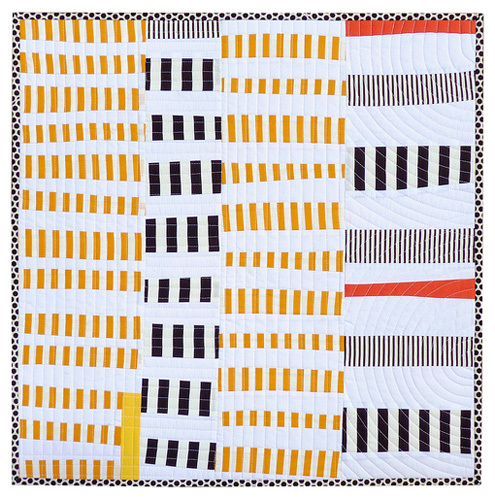 Very cool little quilt Rita and I particularly love your curved quilting lines! It's nice when the creative wave hits you....and you are able to ride it for a while....it's all lovely, the quilting really gives this little zingy quilt some extra zing!! Gotta love those days for sure. This makes me laugh! Good on you...a little walk on the wild side! It looks great...very styly. I love this. I think your brave doing it with no ruler, I live by my ruler! loving the pattern and colours - such a perfect match and very modern! I think this style suits you - you have unleashed your inner wonky self! When will we see wonky full-size quilts? After the next storm?? Bit gothic novel!! Mwahahaha! Mad laughter in the distance! GREAT Quilt!! New style, Woow! I really really like this! It is lovely and abstract - amazing what effects can be created with just a few solids. What is the finished size? Love your little quilt! Sometimes getting liberated is just what the dr. ordered. I think I need to get my stripes out! What fun you must have had! I've only tried this method once before, but NOW I'm going to pull some fabrics and give it another go round! Your speed amazes me! I keep thinking about trying this style of quilt but haven't gotten around to it yet. I wouldn't wish more storms on you, but that is wonderful. Maybe you need a tape of a storm to send you into frenzy. That quilt is amazing. Wow, wow, wow! I love it, Rita! Gorgeous. It's absolutely fabulous! At first, I thought you had pieced the yellow/white and black/white strips, but I see in the closeup that they're just striped fabric (as you said). I love it. 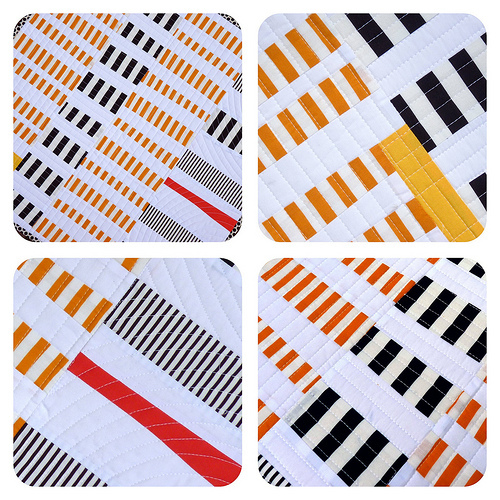 I've been on a stripe collecting mission after seeing Marianne's work on The Quilting Edge. Now, you have added more reasons to collect stripes!! Your mini quilt is fabulous! I totally love this quilt! I so love this! Your quilting is evolving, I'd say. Love that you finished it with polka dot binding. Still very you! Very cute. I agree with Cheryl--the polka dot binding is awesome! Terrific. Ditto everyone's comment (that's the disadvantage when commenting a bit late--my choicest compliments have already been delivered). What I enjoy about this is 1) it shows another side of your vast talent for quilts and 2) a brilliant use of striped fabric. Usually that is so pristine and orderly, but you've given it new life. I love thinking about this use of striped fabric alongside the quilt that Kathy from MO just showed. 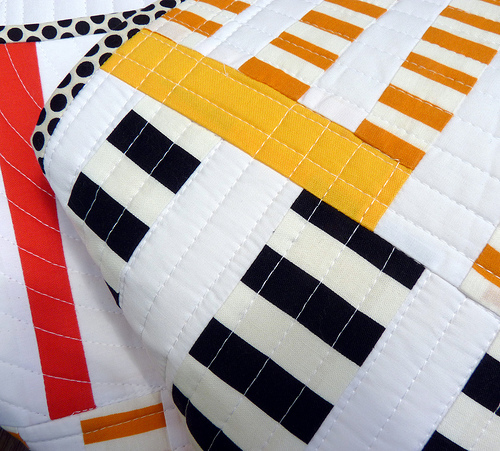 Both of your blogs are such fruitful places for visual designs and beautiful quilts. Yeah! Way to go, Rita. I know you enjoyed making this with all that adventure and discovery. Oh, I love when inspiration strikes for something so very new. Thanks for sharing. It's a lovely quilt! Oh my word I LOVE this. Definitely a departure from your usual style, but it still shows your fun sense of color! Go Rita!!! I loved reading about your stormy adventures. I can *feel* your excitment. Using striped fabrics is so inspired! Oh Rita, this is just wonderful. SPECTACULAR!!! wonky is so much easier to do! I absolutely adore this quilt! Amazing! Great colours and adore the wonkiness and the varied quilting. Looks brilliant! Very cool! I loved that you stretched yourself outside of your comfort zone! I am crazy about this one. Your quilts are always lovely, but this one is a new favorite! Way to step out of your comfort zone!! You amaze me too! I sure wish I could have some of that energy. That quilt is wonderful, and one of my favorites as other have said. Rita- I love this. Wonky is good sometimes. Lovely! 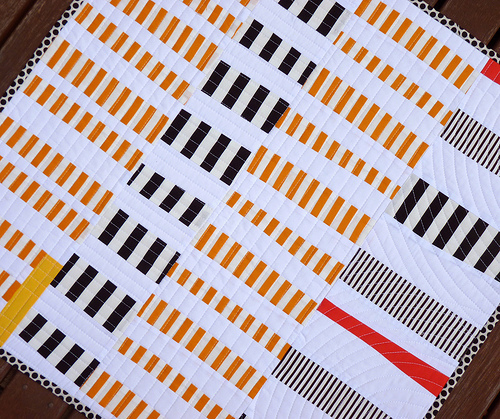 This is such a fun quilt - I just love those stripes. Best quilt you have made in months. Original, crisp and clean. Not too many patterns. Excellent. Like "coloring out of the lines"!!!! Great effect!! Laugh...welcome to the dark side of "wonky" and uneven lines......muh ha ha ha! Your fabric choice is always amazing. What a stunner! Love, love, love. Think how gorgeous that would be in BIG. I absolutely love this! I see Liberated Quiltmaking has had an impact on you after all! Wow! Love this! You have certainly used those stripes to their best advantage. Love the outcome and the colors are wonderful! Love, love this quilt. Isn't wonkiness fun! I LOVE this!!! Amazing what can happen when we step out of our comfort zone. So in love!! And I love the quilting also. This project makes me want to be a little more daring! Thanks for sharing!! What I like, Rita, is, that it is "wonky" but still very much in your style. How big is it? Rita I'd say this is one of your nicest quilts yet. What a great way to use your time in the rain. Love the stripes. Oh wow, I absolutely LOVE this quilt! Beautiful work! I love your colors and design. The quilting, amazing. I love starting a quilt not knowing how it will end up, my favortie way to make a quilt.